Whenever an employer is on plans for a tour for his staff, he has to fill up a request for travel authorization. These days you have electronic automated RTAs for your convenience. 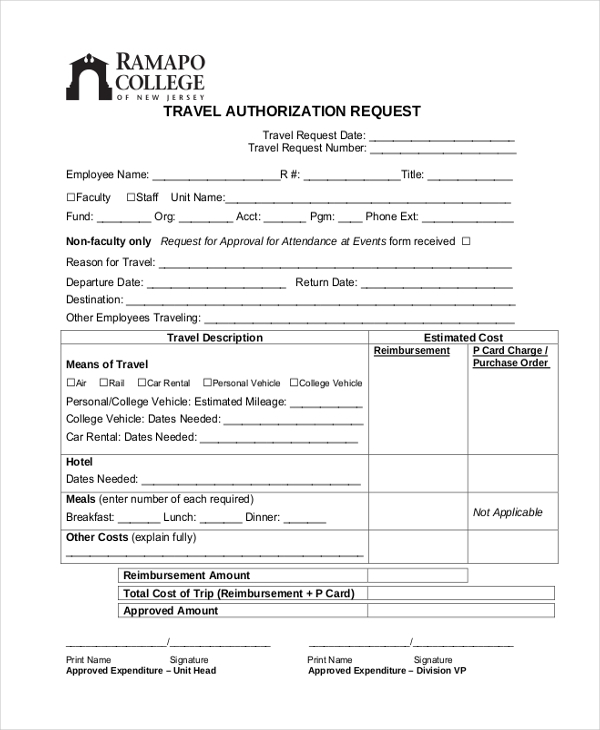 You have to fill up a pre-travel authorization form if you need permission to make any travel to a certain place for professional or academic reasons. The form includes information on tour destinations, lodging, cost of the trip etc. When an employee has to make a trip for professional reasons, he would have to complete an employee travel authorization form with complete information on the trip- that would be further signed by his employer. 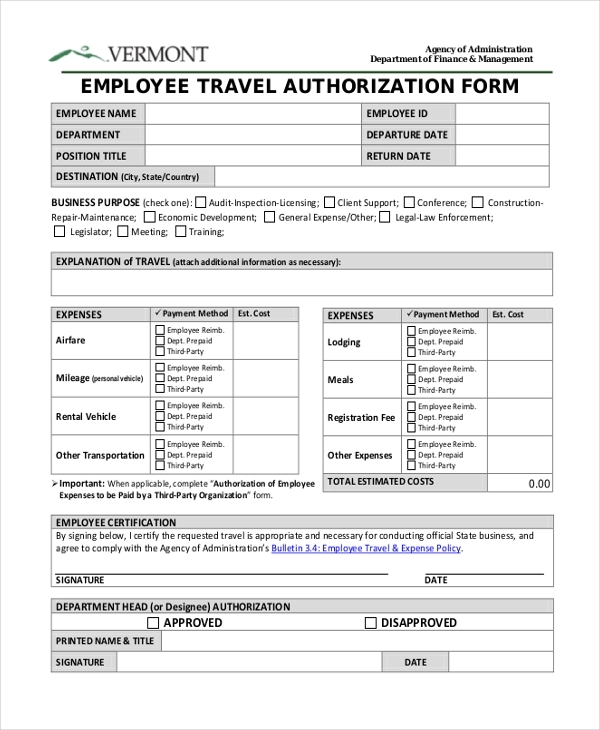 Such a form is widely used in offices taking a business trip to a destination that requires a travel authorization proof for the travel. The traveler needs to keep a duplicate copy of this file after submission. 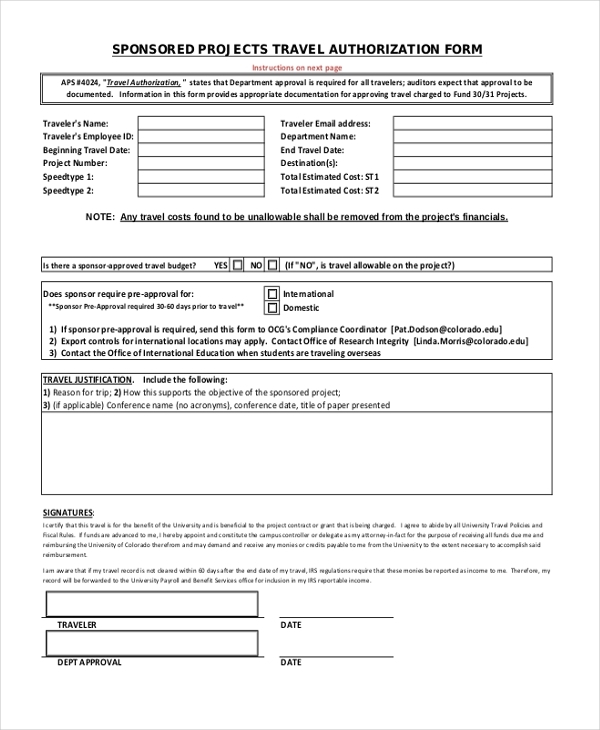 This is an authorization form that must be filled up by all the staffs of a particular organization prior traveling to validate their trip to the specific country or destination. Colleges often tend to organize excursions, trips and many other recruitment related travel plans for its students and teachers. That is when this form is put to use prior to marching on for the trip. 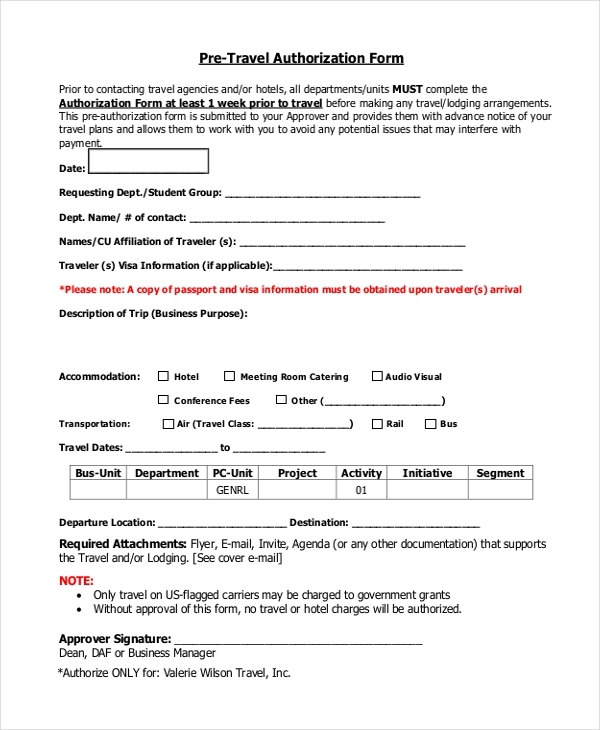 This authorization form is to be filled up and submitted prior to any processing of an international trip. You need to fill in your passport and visa related details here and also the duration of your stay in a particular country. 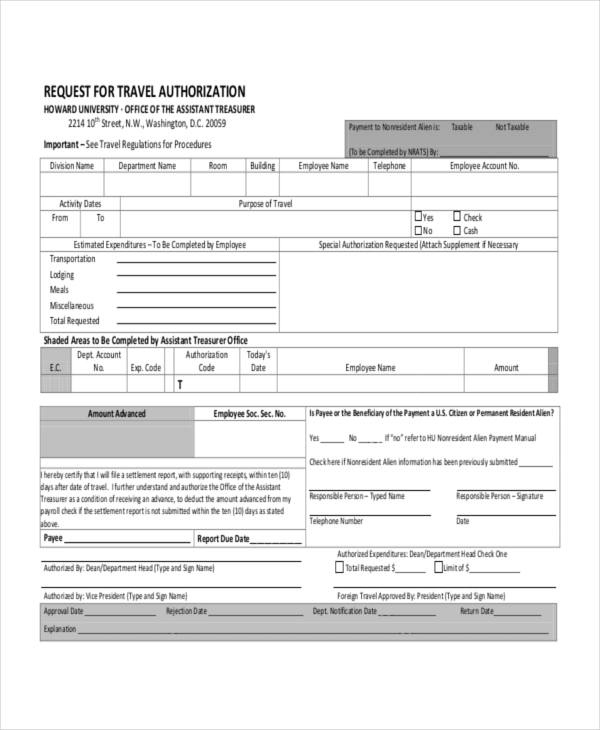 A travel authorization and/or reimbursement request form is a meant to achieve travel approval for a certain place or country. It also states the different costs related to the trip that are to be reimbursed. What is The Purpose of a Travel Authorization Form? Certain countries like USA, Canada or Australia often demand an authorized travel certificate from travelers of some specific visa-exempt countries. This is where you would need the travel authorization form which you have to fill up to ensure that your travel (to that specific destination) is being authorized. 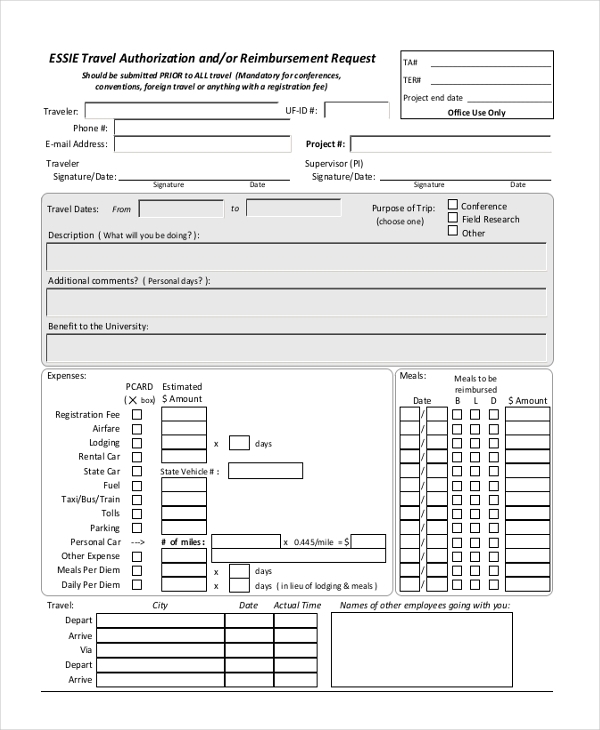 The form has to be filled up before you make arrangements for your travel. These are mostly used for business travels and academic trips. This is to stress here that such forms even double up as reimbursement forms at times which ensure that the traveler will get reimbursed for his/her expenses related to the trip. What are the Different Sections in a Travel Authorization Form? How to Register for a Trip Using a Travel Authorization Form? Are you about to go on a travel that will demand a travel authorization? Well, in that case, you have to get a travel authorization form which must be filled up to seek legal permission for your travel. 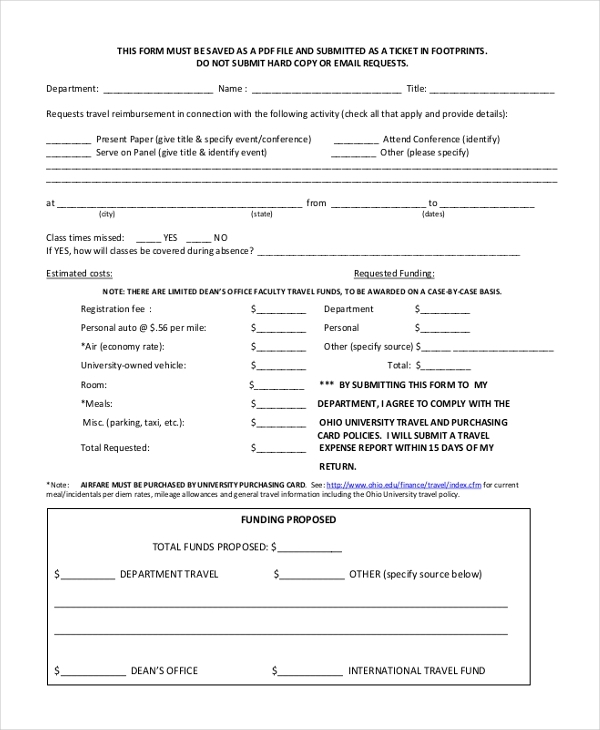 If you are traveling on part of a university or your office, you can attain the form from your respective organization. All you need to do is fill up the form carefully, keeping in mind the basic rules and guidelines. Do make sure that the form is complete and submitted before any travel plans are made. These days you will get electronic travel authorization forms online known as eTAs. You will get a confirmation email if you have filled up the form successfully. 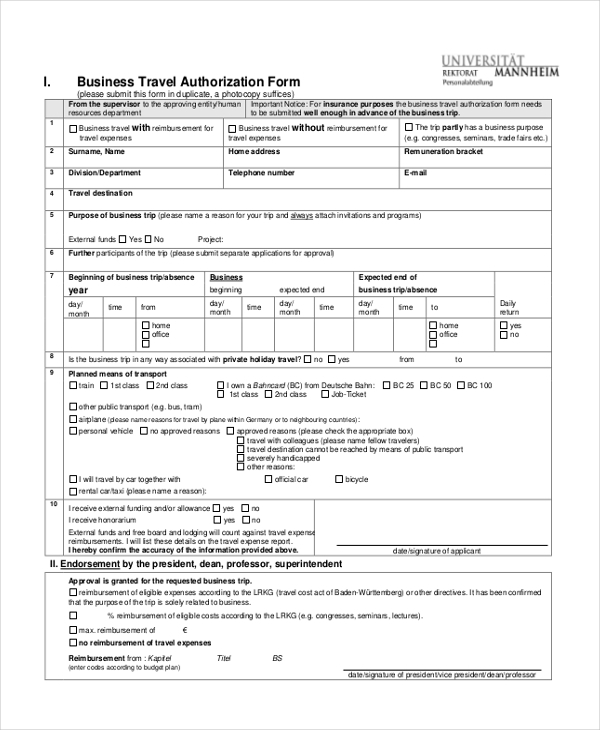 A travel authorization form is your first step when you traveling to a country from a visa-exempt nation. It acts as your gateway to receiving an official approval for the tour. 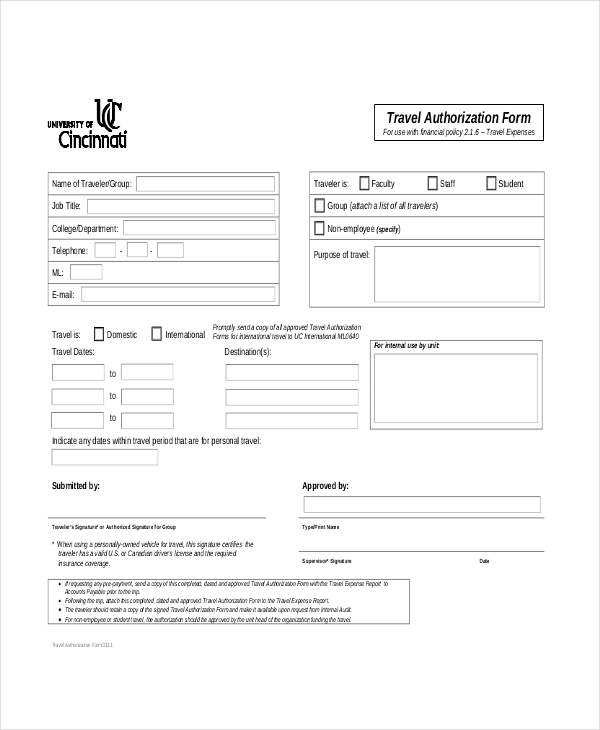 These days you have pre-designed travel authorization form templates that can be easily modified with the traveler’s specific details.